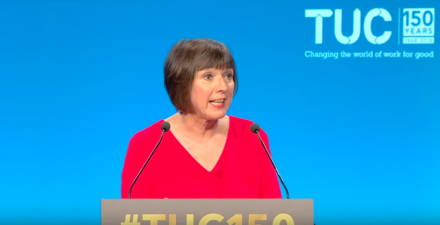 Trades Union Congress (TUC) general secretary Frances O’Grady has said Britain can “win a four-day working week”, “decent pay for everyone” and end the exploitation of workers altogether. Addressing TUC conference, O’Grady also warned the Prime Minister that if she failed to secure a Brexit deal “that doesn’t put workers first” and refused to call a general election, the TUC would throw its “full weight” behind a campaign for another referendum. Below is the speech in full. I’m formally moving the General Council Statement on Collective Bargaining. And my thanks to you delegates, to the General Council, to all our unions. 150 years ago, unions met in a small room in the Mechanics Institute. And here we are, back in Manchester. Still fighting for working people. With the same belief, we’re stronger together. And that same spirit of hope and determination. Let’s also be proud of our contribution to other great causes we’re celebrating. Seventy years of our wonderful NHS. Ninety years since all women finally won the right to vote. And one hundred years since the birth of Nelson Mandela. He led people on that long road to freedom. And I’m proud that the global trade union movement – born in Manchester – backed him every step of the way. This seems to be the year of anniversaries. Because, of course, 30 years ago Jacques Delors gave his famous address to our Congress. 1988. The year Kylie Minogue topped the charts with her song, ‘I should be so lucky’. Hmm. We weren’t feeling it either. Then, as now, we were under a Tory government. And the Prime Minister was rolling out the red carpet for another American President. The original war mongering, anti-trade union, B-list celebrity, President. But Jacques Delors offered something different. He spoke about peace in Europe. And plans to boost trade. And he encouraged us to become architects of a new plan. We won paid leave for working parents. Stronger equal pay rights for women. And at long last – one of the first ever goals of our movement – paid holidays for everyone. Now, countries don’t have to belong to the European Union to be in the single market. But if they want to trade inside the market, every worker must get these rights. They are the rock that national laws and union agreements build on. But now we face Brexit. This country needs a deal that works for working people. But there’s no sign of that. As they stand, the Prime Minister’s Chequers proposals won’t get past Brussels or Westminster. And, if she believes that an agreement with the EU can be delivered by November. Then she’s either fooling herself or fooling the British people. The risk of crashing out is real. Theresa May says that ‘No Deal wouldn’t be the end of the world’. I think most people would like the bar set higher than that. And it’s cold comfort for millions of people whose jobs are on the line. Of course, for wealthy Tory MPs like Jacob Rees Mogg, No Deal is the holy grail. On Planet Mogg, fifty years of hardship is a small price to pay. But, then again, he won’t be paying it. We want a Brexit deal that protects working people. Not just the well-to-do in the posh parts of Surrey. And not just the City of a London, or big business either. But a deal for people who are the backbone of this country. All along, we’ve said that we’re open to any deal that protects workers’ jobs and rights. And peace in Northern Ireland. That’s what most people want. Decent livelihoods. Dignity at work. The kind of country where their children get a better life than they did. That means it’s more expensive to make things here. Bang go good jobs. Up go prices. Dover becomes one big lorry park. So this is what needs to happen next. The PM needs to be straight with us about how her deal would hit jobs. And serve notice we need an extension of Article 50. So, instead, we can negotiate the deal workers need. This isn’t about delaying Brexit. It’s about leaving the EU on the right terms. Where jobs and rights come first. And if she won’t do it. Or if her party won’t let her. Well, then I’m serving notice on the Prime Minister. If you come back with a deal that doesn’t put workers first. And if you won’t call a general election. We’ll throw our full weight behind a campaign. And demand that the terms of the deal are put to a popular vote. After all, we’re the movement that fought for the vote for working class people. And we know that democracy belongs to all of us. And when it comes to our future, one way or another, people must have a say. Because we’ve had ten long years of wage freezes, cuts and austerity. The poet Seumas Heaney wrote that when human beings suffer, they get hurt and they get hard. That’s what the Far Right want to exploit. Some politicians have warned of violence on the streets. Well, I’ve got news for them. There’s been a shocking rise in attacks by far-right thugs. Against Muslim and Jewish people. Against gay and disabled people. And against migrant workers too. Look at Tommy Robinson’s gang. But this isn’t the 1930s or the 1970s. This time, they’re not just organising on the streets. They’re mobilising on Facebook and WhatsApp. Aided and abetted by Russian hackers. Paid for by U.S. billionaires. And when neo-fascists threaten public order and peace. We don’t let them intimidate us. Our response must be more democracy, not less. And any self-serving politician who flirts with the Far Right is playing with fire. A woman who wears a niqab or a burka is still our sister. And we defend the right of Muslim women, and all women, to wear whatever they want. So I want to say this to Boris Johnson. We know what you’re about. He knows exactly what buttons he’s pushing. But our movement will always call out those who dog whistle racism. So, Boris Johnson, shame on you. And here’s another prejudice that needs nailing. From the far-right rich men. They claim to champion the interests of blue collar workers. It may suit them to stereotype everyone who’s white and working class as a racist. The great majority are decent men and women. Look at the trade union movement. Whatever our nationality, race or religion, we stand together as workers. And we will keep speaking up for common decency. Because this movement’s mission is to unite working people. And we can stop the far-right in its tracks. Trade unions bring people together. We build friendships and communities. There are nearly six million of us. And our members are the most powerful force we have. We’re not in denial. We know we’ve got work to do. On attitudes about anti-semitism, immigration, Islam. So, first, we will get behind our workplace reps.
Second, we need parliament to wake up. That means new rules to take big overseas money out of our politics. Not just at election time. But for good. It means tough new duties on social media giants. To stop the spread of hate. And, yes, it must mean a New Deal for working people too. Because it’s true that hospitals are understaffed and waiting lists too long. It’s true school staff are overworked and classes are too big. And it’s true that, too often, our kids can’t find an affordable home or a decently-paid secure job. But we don’t blame Poles or Romanians. And we don’t blame migrants. We blame a Tory government that is bankrupting public services. Tax dodging transnational companies, too greedy to pay their share. And bad bosses, always on the look-out for cheap labour. Under-cutting wages. Driving decent employers out of business. So today let’s pledge that we’ll organise working people. Into movements, in towns across the country. And we’ll work with unions in Europe, and internationally too. To demand decent jobs, homes and public services. The trade union movement will be there, defending communities. But all the while we’ll keep our eyes on the future. Tackle the root causes of hate. And win the better life that working people deserve. Right now, we’re living through a time of rapid industrial disruption. Capital is grabbing more and more of the gains. But as new tech grows, everyone should get richer. Productivity gains from Artificial Intelligence alone could be worth £200 billion. Then we can afford to make it happen. Now, as ever, we demand fair shares. Less time at work. More time with our loved ones. In the nineteenth century, unions campaigned for an eight-hour day. In the twentieth century, we won the right to a two-day weekend and paid holidays. So, for the twenty-first century, let’s lift our ambition again. I believe that in this century, we can win a four-day working week, with decent pay for everyone. Let’s take back control of working time. Ban zero hours. Win two-way flexibility. And end exploitation, once and for all. It’s time to share the wealth. He runs Amazon. Now a trillion dollar company. He’s the richest man in the world. He’s racking up the billions. But his workers are collapsing on the job. Ambulances called because staff are exhausted. Workers afraid to go sick in case they get disciplined. Camping out because their pay won’t stretch to cover the cost of transport. You bet we need strong unions. And we want the right to go into every workplace. That’s exactly what our union organisers intend to do. And the political choices we make now will determine our future. Used for good, technology can protect the planet from climate change. Help advances in health care. Make working lives richer and better. But we know there are risks too. What happens when a company goes bust overnight. When there’s no help for industries to upgrade, or for workers to retrain. We know how much that hurts people, used to respect and a decent standard of living. Treated like nobodies. Abandoned. On the scrap heap. And we can’t let bosses make working life worse. Tracking and timing workers’ every move. Snooping on what staff say on Facebook or Instagram. Sweating them with impossible targets set by computer. But trade unionists are optimists. We’ve won this battle before. And we can do it again. Win a share of the wealth. And negotiate new technology agreements. Because if we want a more equal Britain, collective bargaining is a big part of the solution. Let’s agree that every worker should have the right to a collective voice. Let’s have an obligation on employers to bargain with us, in good faith. And let’s deliver a tech revolution that benefits the whole country. But we need a government that wants to work with us. Not one obsessed with its own party power games. When they should be focused on the real lives of the people they’re supposed to serve. Franklin D. Roosevelt took over as American president, years into the Great Depression. And he spoke of the despair, when a nation looks to government, but the government looks away. Well, today in Britain we have exactly such a ‘hear-nothing, see-nothing, do-nothing’ government. Theresa May stood on the steps of Downing Street promising to help the Just About Managing. But two years later – nothing. Nothing to stop Universal Credit cuts. Nothing to get wages rising. Nothing on zero hours contracts. And nothing for the Windrush generation. What’s this government’s plan to help working people? Absolutely nothing. I believe it’s time for change. We need a better government than this one. Working people deserve a better government than this one. If you can’t deliver a Brexit that protects jobs and rights. If you won’t put back into public hands our railways and Royal Mail. If you won’t build a country where we live in peace with our neighbours. And where, right across the nation, people get fair shares. And take your ‘do nothing’ government with you. Give us a General Election. And we’ll do every thing in our power to elect a new Prime Minister who will.